Never fret when you are presented with a young, peated Scotch. Surely, if you’re a peat lover, you’re not drinking Ardbeg 10 for the lovely vanilla sweetness. You’re drinking it for smoky napalm. Don’t lie. But if you’re an aged Scotch lover, and seeing 8 or 10 years on the label isn’t exactly bagging your badger, you should know that peated whisky retains its hard hitting peatiness when young. 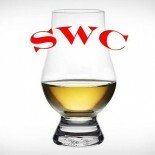 But, Peated whisky tends to lose its power the longer it ages in oak. I can’t explain the chemistry of it all, I just need you to trust me. Talisker 25 is a great opportunity to test this slippery truism. Nose- Quiet smoke barely there. Delicate citrus. Old oak but not overpowering. Fruity variety with apples, lemon, and pear. Coastal feel with iodine. Honey. Orange peel. Taste- Watery, sadly. Honey with no smoke/peat. Slight pepper. Some sherry. Finish- Medium. Sweetness underneath with black pepper. Lemon. Smoke shows up, lingers. Comment- Underwhelming. A quiet malt with little punch. As advertised, the peat was reduced due to the age, but our main complaint was the simple lack of flavor. I wonder what this would be like with more strength. Oh well.